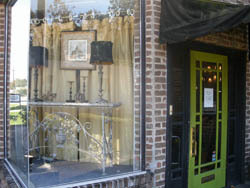 High Cotton Consignment is Mobile's original & most innovative consignment concept. To provide exceptional value and customer service to our consignors and customers by providing a convenient, safe, and effective venue for buying and selling previously owned quality home furnishings and decor on consignment. We accept all types of quality furniture, as well as rugs, lamps, pottery, wall art and other distinctive items for the home. You can own fine quality at great prices!. If you're looking to purchase quality furniture for your home, or treasure hunting for the interesting and unexpected, make High Cotton your first stop for quality furniture at incredible prices. Our creative staff are constantly staging new items & are happy to provide you with decorative ideas. High Cotton & Antiques @ The Loop proudly support and advertise in the following local publications. (Sep 2012) A lifestyle magazine that connects the residents of the Alabama Gulf Coast.